RailsEast wrote: Funny you should mention the movement today....I caught them at Kings Hwy East in Middletown on my way home (just before you saw them), first in line at the traffic light. 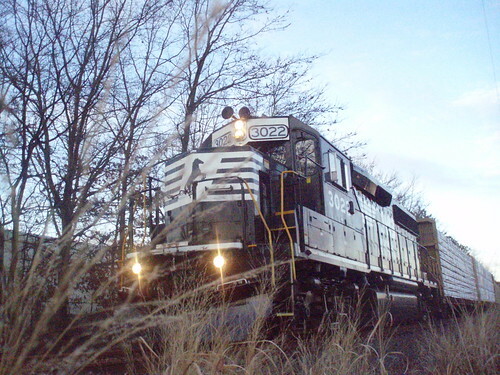 Great, I thought, so I grabbed my camera for a stealth shot, but the MP pulled up to the crossing, stopped and looked me right in the eyes (as if he knew I was a railfan)! Sounds right about the SW1200s those are the only two they have. Perhaps Earle's new units will be of a similar design. Today's Q433 has a USN Genset. Earle's new toy, perhaps? 65-00631 is also sub-numbered "6". That is their regular yard engine inside the main base. The "road train" usually gets two units. A yellow United States Navy locomotive is sitting in Browns Yard this evening. Tues March 3rd, 4:30 pm Earle Navy train crossed Swimming River Rd. Middletown. I did not see the train nor could I tell which direction it was headed, but I heard the train loud and clear and saw that the north set of tracks were freshly cleared of snow. 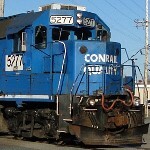 bigblue5277 wrote: Tues March 3rd, 4:30 pm Earle Navy train crossed Swimming River Rd. Middletown. I did not see the train nor could I tell which direction it was headed, but I heard the train loud and clear and saw that the north set of tracks were freshly cleared of snow.